Of course The Golden Mean is about Aristotle in Macedon, and Aristotle’s life to that point; it is also about depression, at times, or the soul’s vicissitudes generally; it is about the relationship between teachers and students, fathers and sons, and the ways they fail each other. Toward the end of the novel it seems as though Lyon wanted us to understand that the novel was about what counts as the good life: certainly this is Aristotle’s question, but in the last fifth of the novel particular versions of this question—“What is the mean between extremes?”; “Is it better to live a life of action or a life of contemplation?”—become more obvious and insistent. I do not know whether this is primarily my failure or primarily the novel’s, but it was not clear to me until the end that these were the novel’s major questions, and I would not have noticed if Lyon had not made it so obvious, almost too obvious, in the final pages. But of course the question about the good life is the one that most occupied the Greek philosophers, so it makes sense that it should occupy a book about Aristotle. I would like to recommend this book, and not just because Lyon is a Canadian author who teaches at my second alma mater, albeit in a different department than mine; I want to recommend it because it is quite good. However, I am writing about it here because it asks a question quite similar to one I asked—maybe too often—on my old blog. Some mild spoilers therefore follow, but this is not a book that is easily spoiled, since its interest is more in characterization and reflection than in plot. “No waste,” I say softly. Of course horror movies also try to elicit both pity and fear, but from what I can tell few horror movies are concerned about how to pursue the good life; they are instead concerned about external threats and (often, though less so these days) about depictions of innocence. External threats are real, and worth worrying about: for instance, the most compelling reading of The Cabin in the Woods relates it to surveillance society, and Stephen King’s Danse Macabre observes that haunted houses are sometimes haunted more by poverty than by anything else. But still, the external threat does not often offer much scope to consider what the good life is, even in relief: the good life is presumably more than the opposite of death, agony, captivity, body horror, and the erasure of identity, though those things may threaten it. Tragedy, however, does have a bit more scope for this kind of question. Alexander’s answer might be a deliberate insult to his teacher, but it is the right kind of answer: Alexander pities and fears a life that does not flourish. My temptation, then, is to turn this question on you and ask, If you were to write a tragedy, what would it be about? Aristotle’s own answer is interesting, though: Aristotle does not have the tragedian’s kind of mind. I’m still not sure what to make of that, and I’ve been giving it some thought. I don’t know what kind of mind Aristotle thinks a tragedian has, or how that differs from his. I also cannot decide whether Aristotle’s answer is fair, or a cheat. The if that starts the question suggests that Aristotle’s answer misses the point: the question is not whether you’d write a tragedy at all, but, in the strange hypothetical case that you did, what its subject would say about you. However, it might be worth saying that the hypothetical is so strange that you cannot say what you would do. In general I have little patience for people waving away hypothetical situations merely because they are hypothetical, but there are hypotheticals which make impossible assumptions. In this case, Aristotle assumes that Alexander fears and pities things, and that these fears and pities can be staged. It might be fair for Aristotle to say, when this question is turned back on him, that he doesn’t feel fear or pity. That is a strange thing to say, and I think false for Aristotle’s character, but it is worth remembering when we pose these sorts of questions to people that the question might not work for them at all. The questions that work well for us, that frame and structure everything that we think and feel, might be alien to another. To be honest, I do not know how I would answer Aristotle’s question. For a few months now I’ve started to realize that I have almost no idea what the good life is. My approach to morality has been bifurcated: on the one hand, a practical kindness that I suspect is less virtue and more openness and agreeability, and on the other hand, a vague, abstract, and critical moral philosophy in which I mostly figure out how various visions of ethics do not work. This is not the right time to talk about this problem, or to talk specifically about whether it is a problem or whether it is a reflection of morality’s very nature; this is instead the time to point out that in The Golden Mean, and in Greek moral philosophy generally, that split is almost impossible because the question of morality is about what kind of life is worth living. There can be no divide because the philosophizing is always about those daily decisions. Aristotle, in this novel, likes to say, “Never be afraid to begin an argument you can’t immediately see your way out of.” It is interesting to me that Aristotle’s question about tragedy invokes fear as a warning against a life not worth living, but in this maxim Aristotle suggests fear is sometimes misplaced. Putting that aside, though—after all, Aristotle’s question about tragedy is about what you do fear, not what you should fear—I try not to shy away from big questions I don’t think I can answer. And yet I think, on reflection, that I have been dodging the question in a way by focusing too much on the question and not enough on how to live in light of that question. I don’t believe that there is ever a way out of arguments, but that’s never stopped me from getting into them; still, if I believe arguments are worth having even when they are ultimately intractable, I need to do a better job of figuring out how to live in such conditions. In reading The Golden Mean, I get a sense of what the alternative might look like. *In my opinion, this book does not try to apologize for Aristotle’s more famously abhorrent positions about slaves and women, but it also rarely tries to address these positions at all. Alexander comes the closest to noticing how suspicious it is that Aristotle’s ideal society benefits Aristotle most of all. **I will forestall some common objections to this exercise. Yes, of course most people do not write novels or poems to encode a worldview, and most people do not read them to decode the author’s worldview, and that is all perfectly fine: I am using this way of reading or thinking about texts as a scaffold for understanding a worldview, and I am not prescribing it as the only or the best way to ordinarily read. And yes, of course many people would prefer to describe their worldviews explicitly, in the form of an essay, if they wanted to describe them at all; again, this question is a scaffold to help me understand the worldviews, not a prescription for the best way to present a worldview. 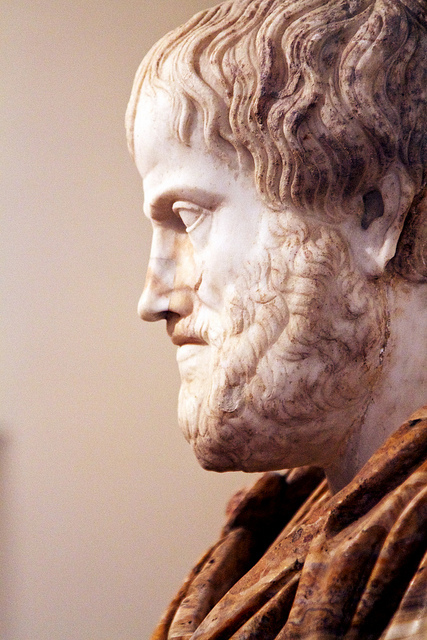 This entry was tagged aristotle, arts and culture, book review, greek philosophy. Bookmark the permalink.